This is a recipe I found on BHG while looking for recipes I thought would ease the transition into gluten free, sugar free meals for our youngest daughter. Maple syrup….it’s sweet and would hopefully satisfy a little of the cravings for sugar. She LOVED it! 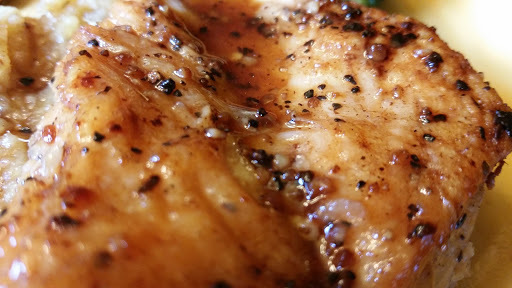 Chicken glazed with maple syrup could NOT be any more simple. 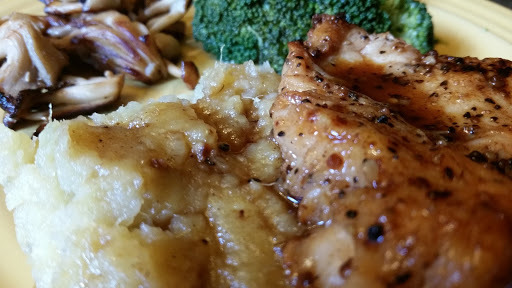 After looking at the ingredients and directions, I was concerned it was not going to be flavorful enough to be a delicious meal that we would want to have again…I was wrong! Sometimes, simple is the best and this is one of those times. I’m going to leave out the directions for baking the sweet potatoes. Once they were cooked, I added them to a medium sized bowl with lots of grass fed butter and cinnamon (because cinnamon is supposed to be helpful for Graves Disease. I’ll discuss our findings on Graves after I have more info/facts under my belt.) I am going to post a picture because we found these wonderful sweet potatoes in a local international farmers market. They are from Korea and were a gorgeous purple color. The other one is a local sweet potato. The picture really doesn’t show up the beautiful color. In a medium bowl, toss the chicken breasts with the Montreal Steak Seasoning. Melt the butter in a large saute pan. Add the olive oil and bring to a medium high heat. Add the chicken breasts and cook for 6-7 minutes until cooked to an internal temp of 170 degrees, turning once midway through the cooking time. Remove the chicken from the pan and set aside. Pour off any additional fat that is remaining. Add the maple syrup and let this simmer for a couple of minutes. Pour over the chicken and serve with the sweet potatoes as a base. So simple, and so delicious!